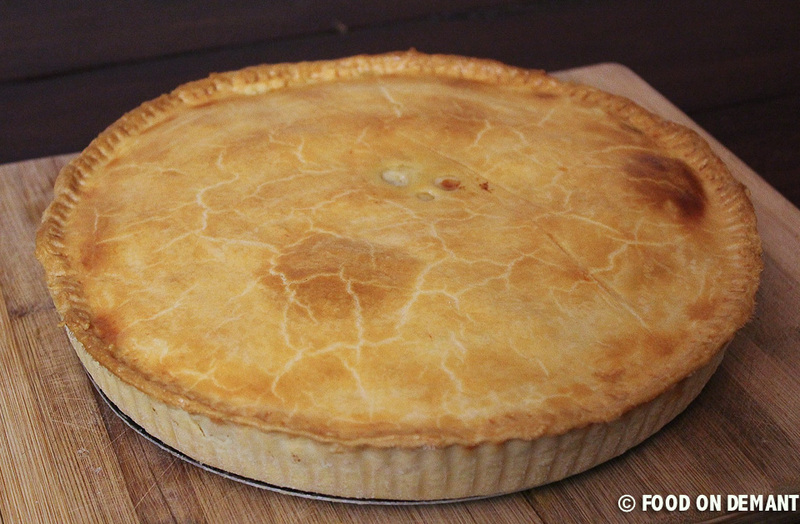 This pie is nothing less than delicious…. 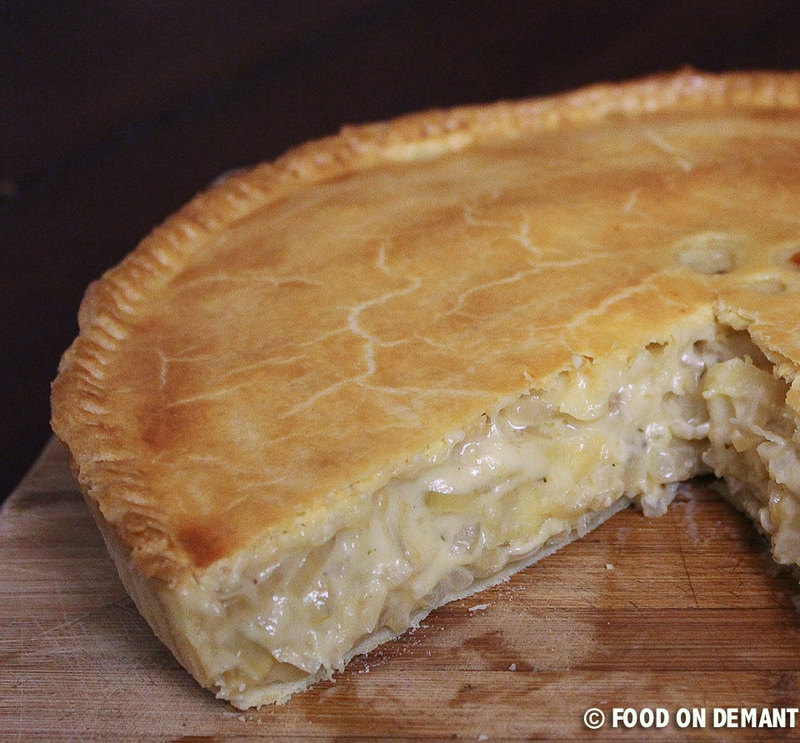 The combination of the crisp pie dough and the perfectly seasoned creamy caramelized onions is indescribably good!! It is so good that we eat almost all of it alone and went to bed with a terrible stomach pain! 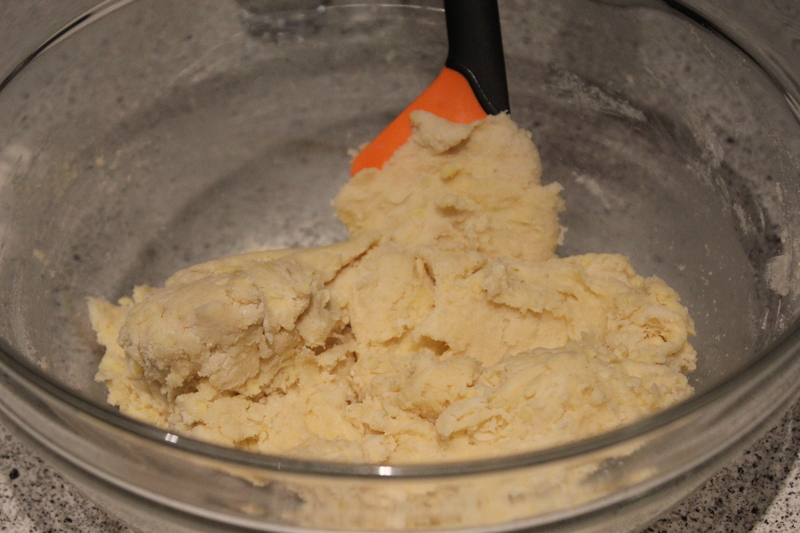 Pie dough: Cut the butter in to small cubes and place it in a mixing bowl together with flour and salt. Use an electric hand mixer or stand mixer to mix until it looks like breadcrumbs. Add the two beaten eggs and the lemon juice and mix until just combined. Pour the combined dough on to slightly floured surface and knead for a few minutes. Make sure that there are no lumps in the dough – it should be smooth. Wrap in plastic foil and fridge while making the caramelized onions. Caramelized onions: Melt the butter in a sauce pan at medium heat and add onion slices and thyme leaves. Stir once in a while until onions begins to get soft and stick to the bottom of the pan. This takes about 15-20 minutes at medium/low heat. Then add about half of the apple juice and let simmer until evaporated before adding the other half of the apple juice. Sprinkle the flour on top of the caramelized onions when the remaining apple juice has evaporated and stir to combined. Then slowly pour the cream into the onions while stirring to combine. Let simmer for a further 3-5 minutes before tasting and seasoning with salt and pepper. Set a side while rolling out the pie dough. Cut the pie dough into two pieces – 2/3 and 1/3. Roll the largest piece out until it is large enough to cover a the bottom and sides of a 9 inch pie dish. Place the rolled dough in a greased and floured pie dish. Pour the caramelized onions into the pie and sprinkle with the shredded gruyere cheese. Grease the edges with beaten egg. Roll out the remaining dough, cut a few holes in it so any remaining liquids can evaporate, and place on top of the caramelized onions. Press the dough together with your fingers or a fork. Brush the top of the pie with the beaten egg. Bake at 400F for 30-35 minutes and let rest on a wire rack for further 15-20 minutes before serving. 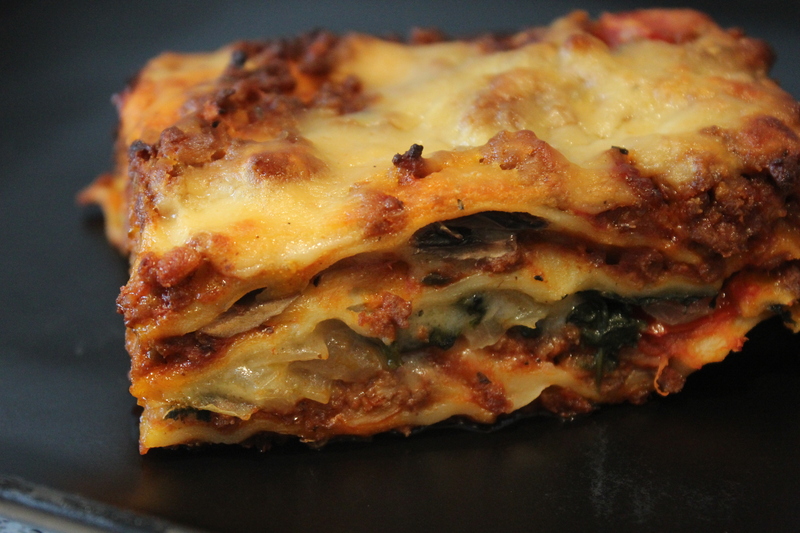 Most people use béchamel sauce in their lasagna but you can use whatever sauce you like. Do you have a favorite lasagna recipe?? Pasta: Combine the three ingredients for the pasta and knead the dough until evenly combined and firm. Cover with plastic wrap and fridge for one hour. 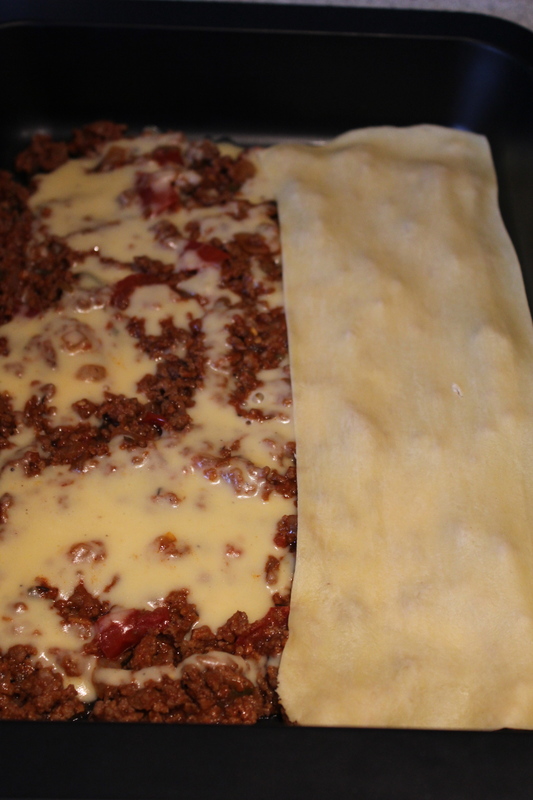 While the pasta dough is resting in the fridge you can make the meat sauce and prepare the filling. Roll the pasta dough on a pasta maker when you are ready to assemble the lasagna. Meat Sauce: Melt the butter in a medium sauce pan and sauté the chopped onions and garlic together with dried thyme and oregano. Transfer to a plate when the onions has absorbed all the butter. Brown the minced meat in the same sauce. When browned, add the sautéed onions, tomato paste, chopped tomatoes and red wine and stir to combine. Turn down the heat and let cook until most of the liquids has evaporated – approximately one hour. Cheddar Sauce: Melt the butter in a sauce pan, add the flour and whisk to form a roux. Slowly pour the milk into roux while whisking. Be careful not to add the milk to fast as it will ruin the roux. Turn down the heat and let cook for a few minutes while the whisking. Remove the roux from the heat, add the shredded cheese and stir until melted and combined. Season with salt and pepper. Filling: Wash the spinach in cold water to remove any dirt. Sauté in a medium hot frying pan together with the chopped onion until all the spinach juice has evaporated. Transfer to paper towel to dry. Clean the pan and to do the exact same thing with the mushrooms. This lasagna has three layers of pasta in an 7 x 12 inch dish, so if your dish is smaller/larger you should ignore the measures used below. Cover the bottom of the the dish 4/5 cup meat sauce. 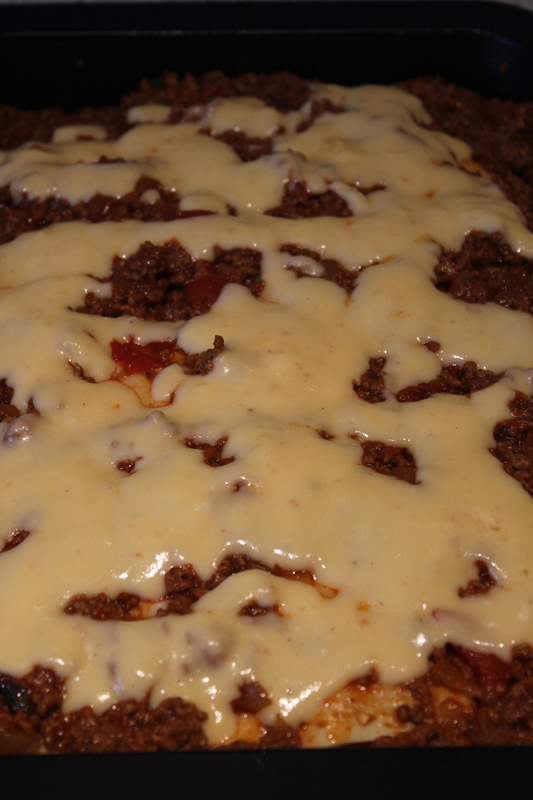 Pour 1/2 cup cheese sauce on top of the meat sauce and cover with pasta plates. Do the same with layer no. 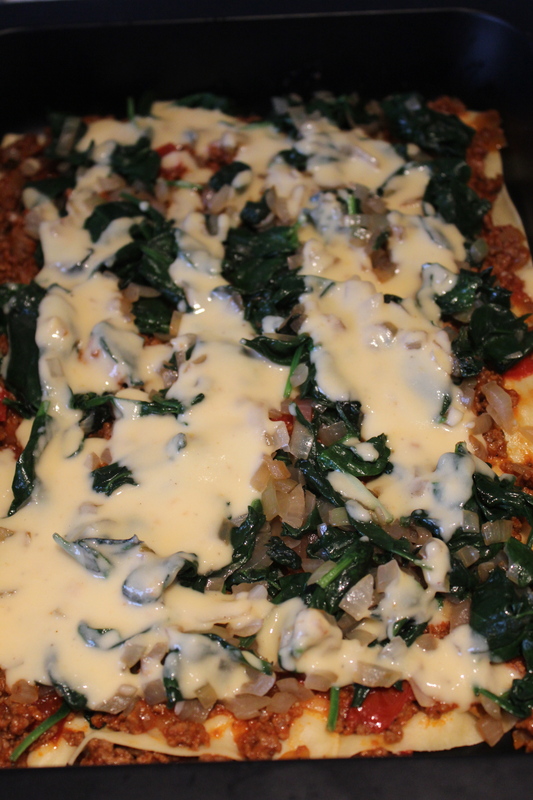 2 but place the spinach between the meat- and cheese sauce. In layer no. 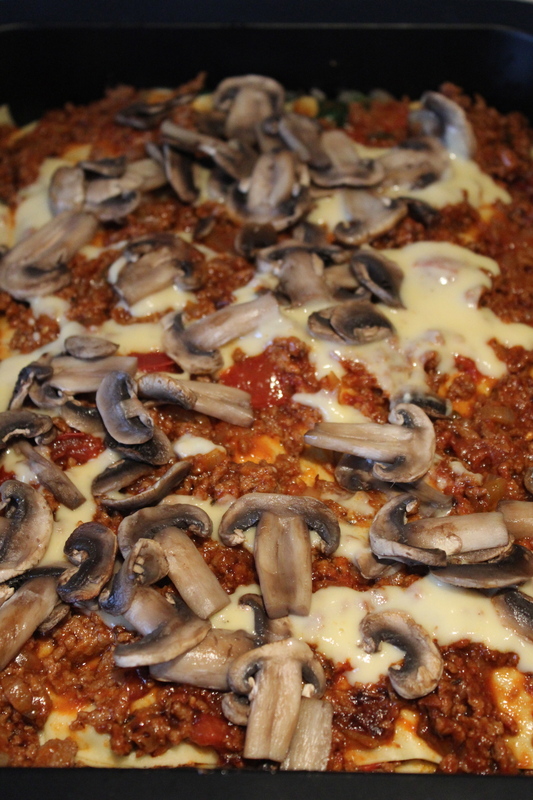 3 is meat sauce, cheese sauce and mushrooms. Now you should have used all your pasta plates (if your dish is 7 x 12 inches) and the final layer consists of the remaining meat- and cheese sauce. Cover with aluminum foil and let rest in the kitchen table while your oven reaches 400F. Leave the foil on and bake in the middle of the oven for 30 minutes. Then remove the foil and bake for additional 15 minutes. Let rest for 15-30 minutes before serving. Serve with a an easy and fresh salad, for example romaine lettuce, sweet corn, tomatoes and cucumbers. 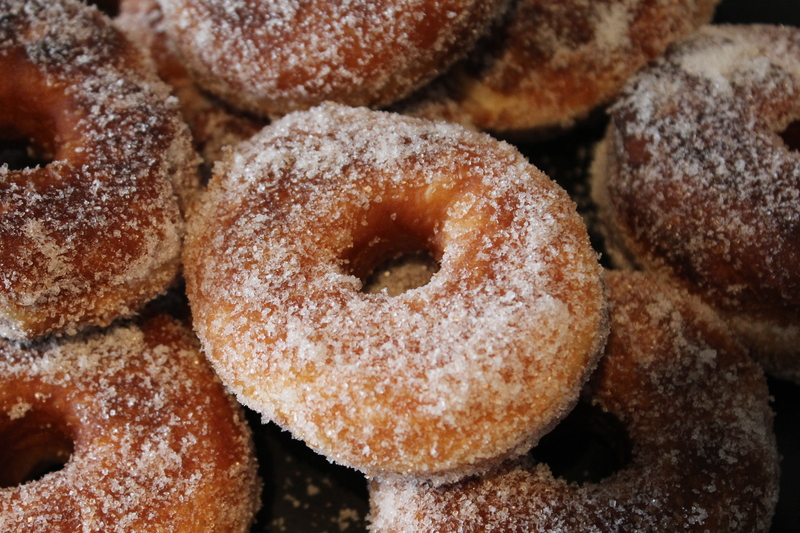 The recipe for these donuts is actually a CRONUT recipe (for those of you who do now what cronuts is, the easiest way to describe them is that it is a love child between a donut and a croissant). 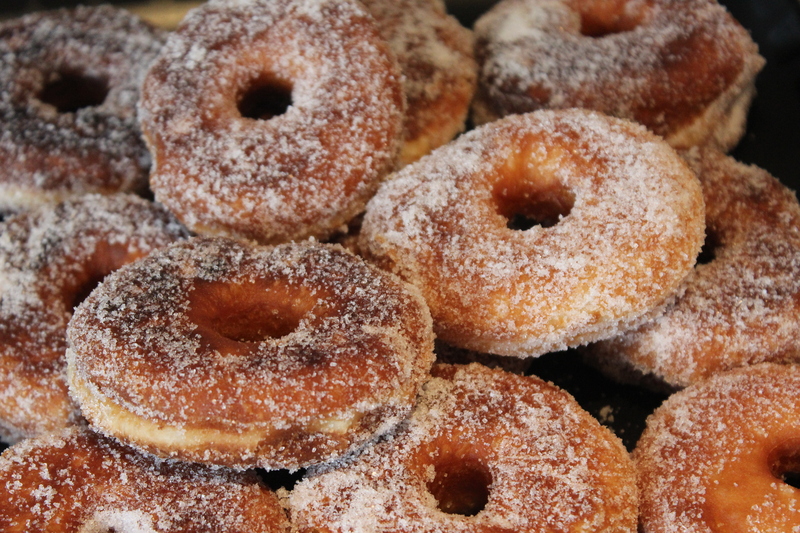 Actually we are not allowed to call it cronuts, as the ‘inventer’ has gotten copyright on the name – how wired is that?? Combine water, milk and yeast in a mixing bowl and stir for a few seconds. Cut the cold butter into small cubes and place it in a blender together with flour, sugar and salt. 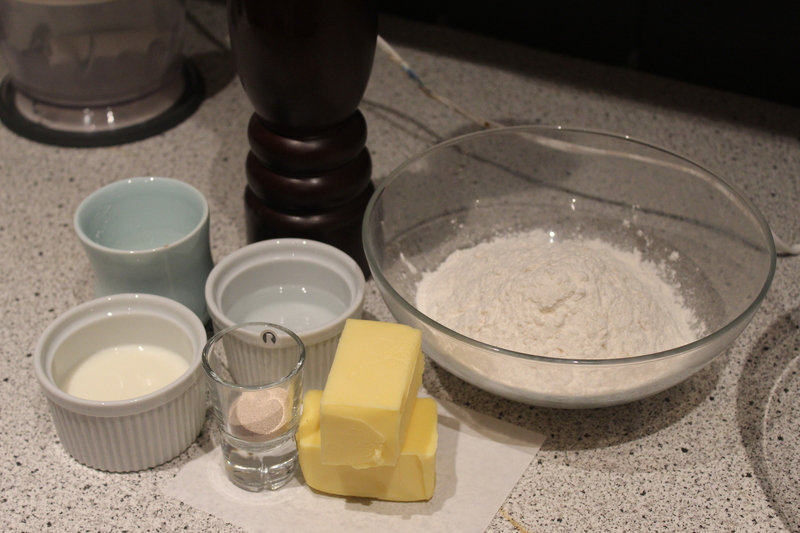 Blend for a few seconds until butter and flour begins to crumble. Add the crumbled flour mixture into the wet ingredients and use a plastics spatula to combine. Pour the combined dough onto a floured surface and form a ball. Place in a bowl and cover with plastic wrap. Let rest in the fridge for 2 hours. 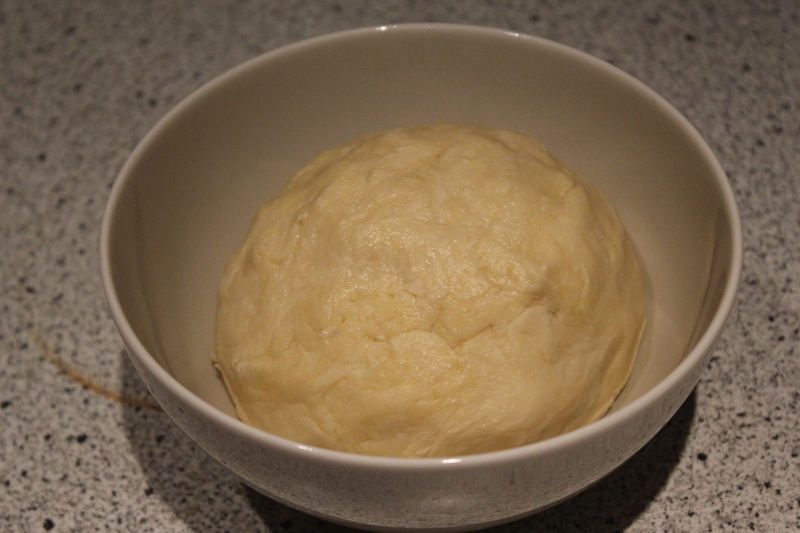 Place the rested dough on a lightly floured surface and roll it out until it is approximately 1/2-inch thick. Fold and repeat the process 4-5 times. Fold the last layer three times, wrap it in plastic foil and fridge over night. Unwrap the rested dough and roll it out on a slightly floured surface. It should be approximately 2/3 inches thick. 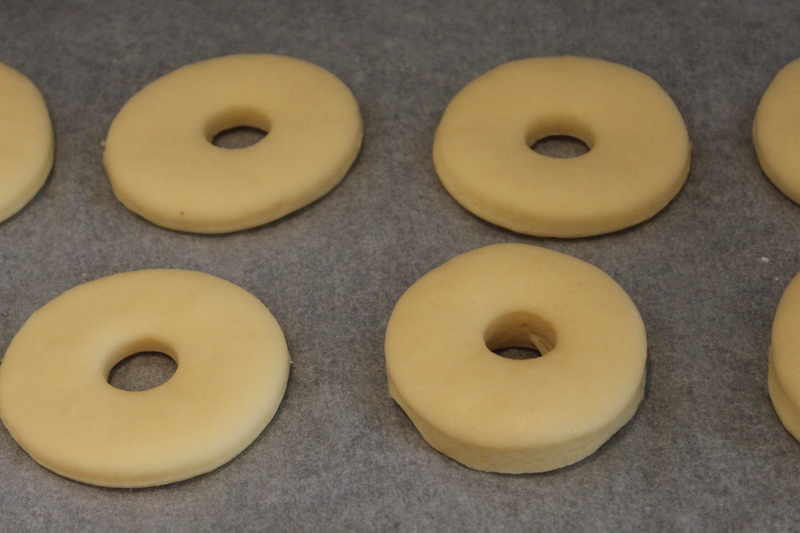 Use a 2 1/2 inch pastry cutter to cut out 14 donuts, and a 1 inch pastry cutter to cut the hole in the middle of the donuts. 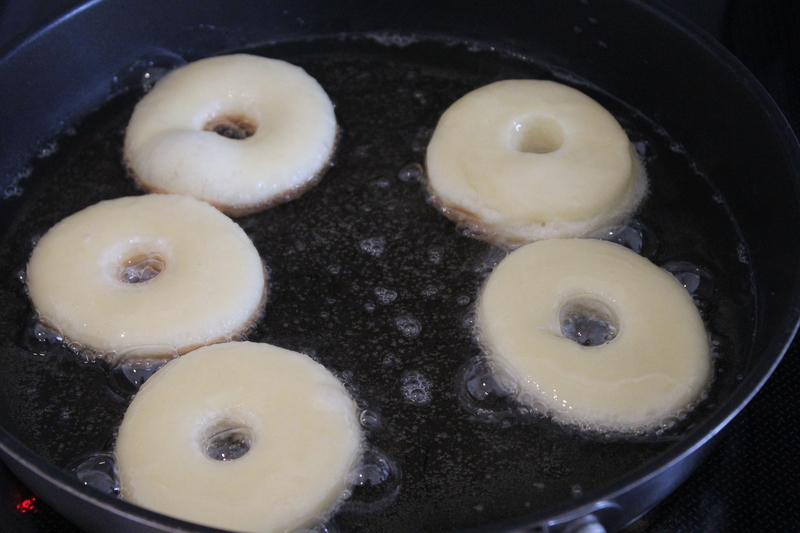 Place the donuts on a piece of baking paper, cover with a kitchen towel and let rest for an additional hour. Place the canola oil in a frying pan and turn on the heat. The oil is perfect at 300F. 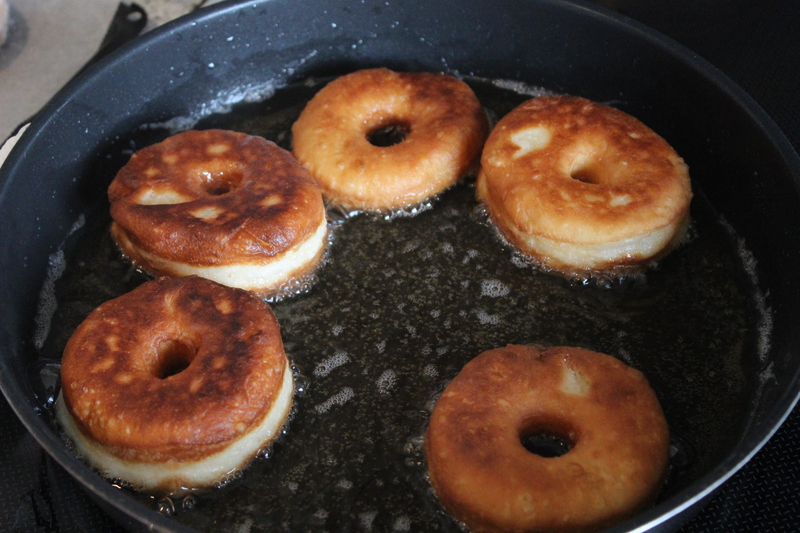 Fry the donuts for 2-3 minutes on each side or until golden brown. If you do not plan to eat them all at once, you can store them for 2-3 days in an airtight container at room temperature. This week is ‘try something totally new week’ and the Middle Eastern cuisine seemed to be worth a try. We have successfully made lamb before but never minced lamb, so we were quite excited about the result. 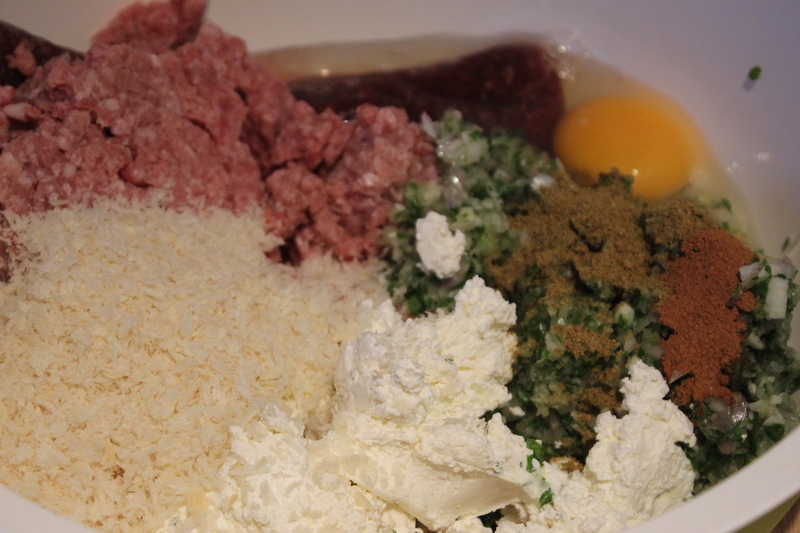 Another thing with these meatballs is the spices…. The Middle Eastern cuisine use a lot of interesting spices and one of them is cinnamon. In Denmark we often combine the smell and taste of cinnamon with christmas, cookies, cakes, rise pudding and so on… So when a meat recipe calls for cinnamon, we rethink making it! But today we are both glad that we decided to make these fabulous meatballs, but in our version of the recipe we have only added half of the advised cinnamon and you can still taste it, so we are glad that we did not add the entire recommended amount. Place all ingredients for the meatball, except canola oil, in a mixing bowl and knead until combined evenly. Make teaspoon-sized balls and fry them in canola oil for a few minutes until golden brown. Remove the meatballs from the oil and place them in a heat proof dish and bake in the oven at 400F for 15-18 minutes or until they are well done. While the meatballs bake in the oven, you can prepare the yoghurt. 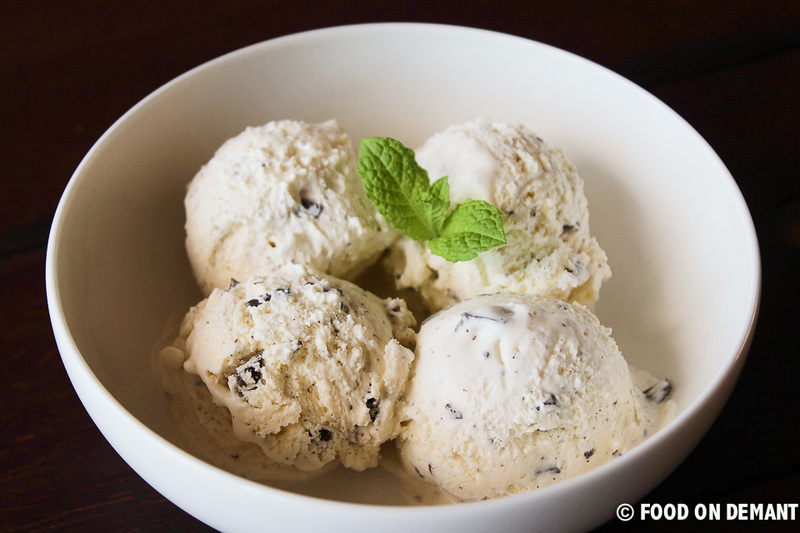 Place all the yoghurt ingredients in a bowl and stir well to combine. Fridge until serving. 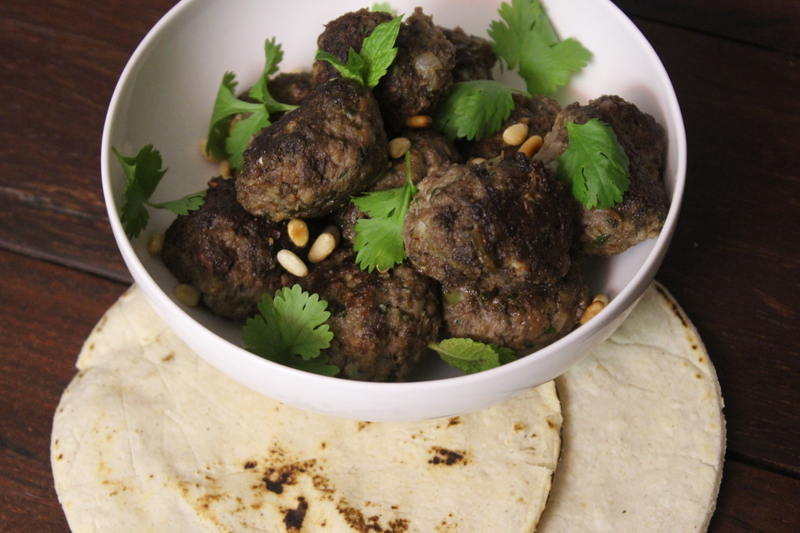 Sprinkle the pine nuts and herb leaves over the finished meatballs and serve with yoghurt together with chopped cucumber, tomatoes and naan bread or as we had it, in corn tortillas. Last night we had these delicious breaded ham schnitzels with buttered capers and celery puree. Traditionally, schnitzels is made from veal, but we often use ham instead as it is cheaper (and we almost always have ham in freezer )! Another tradition when serving schnitzels is butters peas, french fries, capers and anchovies, but we wanted to try something new and with celeriac growing in the garden it was a obvious choice. If you are not a huge fan of lemon thyme, you can of cause replace it with regular thyme, some other herb of your own choice – or you can just leave out the herbs and serve a plain celery puree. 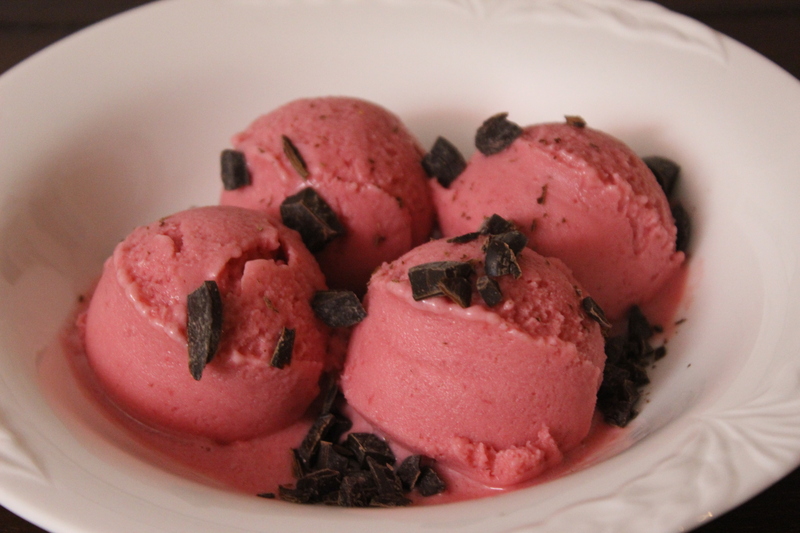 Hope that you will enjoy making and serving this recipe for your friends and family. Season the schnitzels with salt and pepper and turn them in flour followed by the beaten eggs and the bread crumbs. Leave in the fridge to rest while you make the celery puree. Peel the celeriac and cut it into 1-inch cubes. Place in a sauce pan together with the milk and bring to a boil. Be very carefully when you boil milk. Turn down the head as soon as it begins to boil and let cook for 20-25 minutes or until you can mash a cube with a fork. Separate the milk from the celeriac and place celeriac and thyme leaves in a blender and add tablespoons of milk the milk while blending, until you reach the wanted consistency. Season with salt and pepper and let rest while you fry the schnitzels. Melt 1/2 tbsp. butter at medium heat and fry two of the schnitzels for 3-4 minutes on each side. Add another 1/2 tbsp. butter when you turn the schnitzels. Do the same with the two remaining schnitzels. Toss the capers in the remaining butter from the schnitzels. 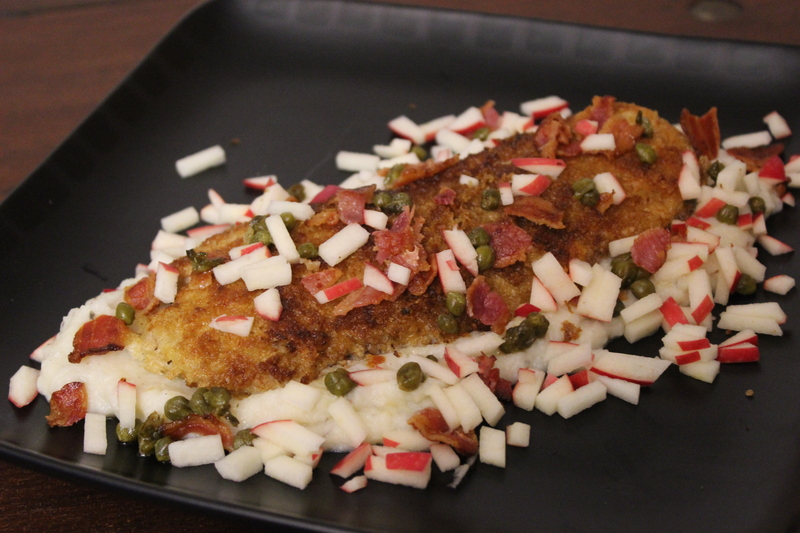 Serve the schnitzels on top of the celery puree and garnish with the buttered capers, crumbled bacon and diced apples.